Win Eye Glasses, Dresses in Hot Summer Fashion Giveaway – 35 Winners!!! Win Eye Glasses and Dress in the Hot Summer Fashion Giveaway! in celebration of her 1st Year Blogging Anniversary! Firmoo Optical is giving away TOTAL OF 35 GLASSES ! WILL BE JUDGE ACCORDINGLY AND EACH WIN GLASSES! . Only the first 3 entries are mandatory and the rest are optional, but of course the more entries you complete, the greater your chances of winning this prize! This giveaway will end on MAY 4, 2012 @ 12:01 am (EST). Please note that you only need to enter this giveaway ONCE since we are all using the SAME Rafflecopter widget code. Feeling Unlucky with random picking? Kindly Fill in the form below. Thanks and Good luck! TO MAKE IT SUPER FABULOUS! SLEEPLESS GAL IS GIVING AWAY HER STUFF!!! A UNAROSA DRESS WORTH 100$ (4,160php) AND IS OPEN WORLDWIDE!!! WIN FASHIONABLE HOT GLASSES AND A DRESS! Would love to win something!! 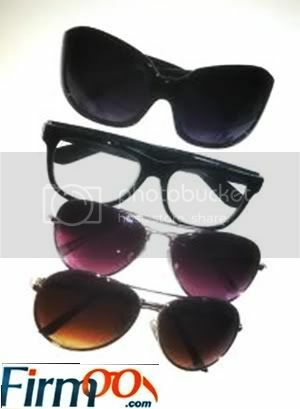 I like the Women’s Full Frame Wrap Around Plastic Sunglasses #OTO2585 in black. Cool giveaway. .I want one!